Led by Cuesta College physics instructor Dr. James Eickemeyer, two groups of Cuesta College students recently traveled to multiple countries around the world to study physics and climate change. The trips spanned the countries of Switzerland, New Zealand and Australia. 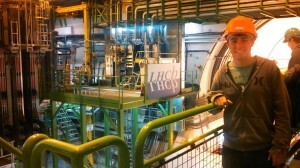 Receiving two credits each for a field studies in physics course, 17 students explored the principles of nuclear physics via a tour of the Large Hadron Collider (LHC) located near Switzerland. The collider is the world’s largest and highest-energy particle accelerator. Built by the European Organization for Nuclear Research (CERN), the LHC is considered one of the greatest engineering milestones of mankind. The structure measures 17 miles in circumference and lies in a tunnel nearly 600 feet beneath the Franco-Swiss border near Geneva, Switzerland. The trip took place from May 26 – June 9. Then on June 23, six students took traveled to New Zealand and Australia, where they explored the principles of global warming as it relates to environmental changes. The Global Warming Studies class gathered data on decreases in glacier size, increases in desert size and changes in the health of coral reefs. “We swam with a marine biologist through the Great Barrier Reef to determine the health of the reef, and the possible associations between the reef health and global climate change,” Dr. Eickemeyer said. This was the second time Dr. Eickemeyer led a course in Switzerland; the first trip took place last summer. He plans to continue the Global Warming Studies course next summer in Europe. Subjects: Cuesta College Education Science! What man-made global disaster caused the mile thick ice sheets to recede from New York City? So you came here to call people socialist and global warming puppets? Just because you don’t understand science is no reason to be a comment troll. One more reason to vote against the Cuesta College bond measure. What a waste. Great vacation for these kids but seriously???? The school didn’t pay for this. The students paid their own way.